BANFF, ALBERTA, Canada – Over the past decade, Team Building/ Leadership activities have exploded in popularity amongst major corporations; this movement has endorsed cooperation and efficiency between employees and their coworkers and between employers and employees alike. Although any group activity such as rafting or hiking will encourage enduring relationships, Inside Out Experience has designed a number of activities which specifically target solidarity, fun teamwork and initiative as well as many more beneficial skills that can be transferred back to the workplace. When faced with a challenge scenario, team members are encouraged to recognize their own strengths and weaknesses, and ideally, share these with their team. The challenges and thus the resolutions are remembered far beyond the day. Inside Out Experience Inc. has been successfully combining adventure and learning as a way for corporations to reward and educate their employees for 15 years. Our combined programs provide challenging team activities and fun experiences with powerful training in areas of group/team learning, leadership/management skills and communication. Our programs can be organized and operated throughout Kananaskis, Banff, Canmore, Elbow Valley, Bragg Creek, and Calgary. We can also come to you! Most team building activities are arranged so that they will generally last a minimum of 2 hours up to a full day and are appropriate for any group size. Although many programs are suited to an indoor facility we prefer to organize most events in the great outdoors keeping with our ethos of bringing people from the inside…out! Experiential programming requires people to learn by doing using carefully designed “experiences” (activities, exercises, tasks) in which participants are required to use skills of communicating, decision making, effective planning, problem solving and more. The experiences are conducted within an atmosphere of community, dignity, well-being and fun. Outdoor corporate team building experiences including whitewater rafting, hiking, mountain biking, horseback riding, cross-country skiing, and/or snow-shoeing. Please check our Team Building Options page for a brief description of several examples of the kind of learning exercises we can provide. Don’t stay inside the city, come out and spend some time in Canada’s outdoors. You will feel rejuvenated, relaxed and refreshed. Inside Out Experience Inc. has been successfully combining adventure and learning as a way for corporations to reward and educate their employees for 15 years. Our combined programs provide challenging team activities and fun experiences with powerful training in areas of group/team learning, leadership/management skills and communication. Our programs can be organized and operated throughout Kananaskis, Banff, Canmore, Elbow Valley near Bragg Creek, Calgary and Red Deer. We can also come to you! 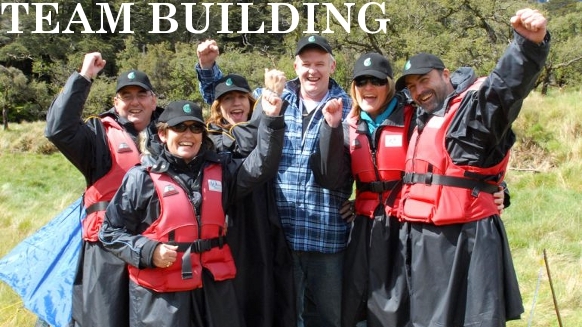 We have an array of original corporate team building activities to encourage learning experientially. Many of our team activities can be completed in as little as 15 minutes, making them perfect for breakout sessions or an added touch to your coffee break or lunch break. Most programs are arranged so that they will generally last a minimum of 2 hours up to a full day and are appropriate for any group size. Although many programs are suited to an indoor facility we prefer to organize most events in the great outdoors keeping with our ethos of bringing people from the inside…out! Increased ability to move beyond barriers and obstacles to achieve team targets/results. Enhanced motivation, concentration, problem solving and productivity of individuals and as a team. Improved understanding of the importance of developing and maintaining team relationships and camaraderie within an increasingly competitive world. Enhanced understanding and appreciation of ones own and others unique skills and abilities. Experiential programming requires people to learn by doing. Their involvement is about solving a problem related to the workplace and/or seeing themselves in a different way using metaphoric activities. It is the lesson learned from experiences that is generalized and adapted/adopted for application to workplace situations. Experiential programming requires people to learn by doing useing carefully designed “experiences” (activities, exercises, tasks) in which participants are required to use skills of communicating, decision making, effective planning, problem solving and more. The experiences are conducted within an atmosphere of community, dignity, well-being and fun. Due to the experiential nature of our programs we have found it best to modularize activities. In this way we can weave them into many types of outdoor corporate team building experiences including whitewater rafting, hiking, mountain biking, horseback riding, cross-country skiing, and/or snow-shoeing. We pride ourselves in the “generative learning” we encourage from the program participants. This is accomplished through varying degrees of debriefing depending on the request of the client. Please check our our Team Building Options page for a brief description of several examples of the kind of learning exercises we can provided. The emphasis is on the need of the client and we customize the programs prior to delivery, based on pre-workshop meetings with your representatives. For a more detailed program which can include accommodation, transportation, meals, meeting rooms, classroom Team Building programs and more please refer to our Group Packages page for further information.